In times of Silicon Valley startups rise from the hotbed of an unprecedented entrepreneurial spring in numbers that are unheard of. But which sprouts make the highly competitive race towards the sunny success at the end of the day? 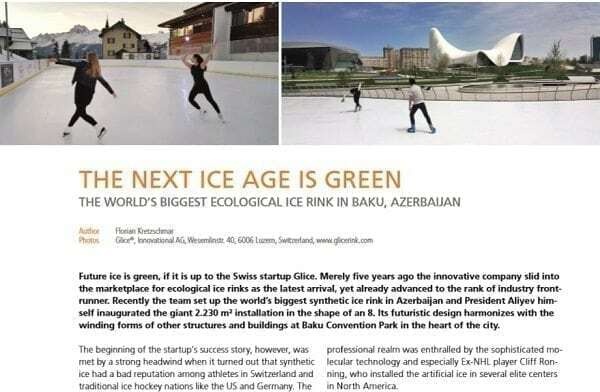 Glice, a young startup from Switzerland made its way to the market zenith for ecological ice rinks within merely 5 years and recently installed the world’s largest artificial rink in Azerbaijan; even president Aliyev wouldn’t miss the inauguration. Yet the management stays humble: “Glice isn’t a company that thinks to know everything already. We keep our eyes and ears open to connect with people who are more competent in their areas of expertise,” says CEO and Co-Founder Viktor Meier. His business-baby was born out of a lazy TV afternoon in 2012. Back then Meier’s entrepreneurial spirit was caged in by an uninspired office job that didn’t resemble any of the youthful dreams the Swiss innovator had in mind. Armed with nothing but a backpack he had previously traveled the world for years and settled in the US to learn marketing tricks and startup dynamics. Back home in Switzerland, a 9 to 5 career lured with the comforting security of monthly paychecks, but offered no space for adventurous entrepreneurship. When Meier saw a BBC documentary on Toni Vera, a former Spanish ice hockey pro, who experimented with artificial ice, his office-cell couldn’t hold him any longer. He called Vera and shortly thereafter the two teamed up with their athletic and marketing expertise. 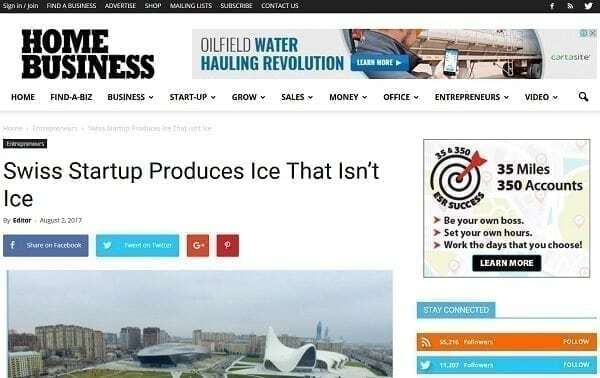 Glice was born, but as with so many startups it wasn’t an easy delivery to the market world: Because the brilliant idea – artificial ice rinks that are green, cheap and climate-independent – didn’t resonate at all with traditional ice hockey nations such as Switzerland, Germany and the US. The existing synthetic ice simply didn’t impress professional athletes, who thought it no serious alternative to real ice. Together with a team of scientists and engineers Meier and Vera had to come up with a whole new molecular technology, which eventually made the quantum leap into the athletic realm. NHL legend Cliff Ronning was the first professional ice hockey player who realized the potential of the novel ice that wasn’t ice and installed several artificial rinks in his Northern American elite centers. With the new Glice formula synthetic ice rinks were suddenly up to the challenge of competing with their conventional icy cousins, at a fraction of the maintenance and ecological costs involved: The artificial alternative makes the vast amounts of water and electricity involved with the operation of traditional ice rinks superfluous and allows for installations even in the least expected corners of the world. As a professional ice hockey player from sunny Spain, Vera knew just too well what scarcity ice rinks in warmer climate zones are. With the success among professional athletes came the attention of the leisure industry and the quick market-rise made up for the initial steep and difficult ascent of Glice ice. By now the Swiss team has installed synthetic ice rinks in more than 70 countries on 5 continents, among others in African desert lands like Egypt and famous clients include brands like Coca Cola and Red Bull. Installations vary largely in size and range from the latest 2230 m2 giant in the heart of Azerbaijan’s lively capital Baku to tiny installations in private gardens, garages and basements. Other venues encompass hotels such as the Venetian in Macao and the Jumeirah in the Maldives as well as malls; even during the Olympic Games 2016 in Brazil a Glice rink made its appearance and welcomed the Brazilian national ice hockey team. No wonder, considering that the CEO himself spends several months a year traveling the world, blending business with leisure. The networking associated with globally scattered team members and local partners takes place in a cloud, where information is exchanged in real time. The digital world with its near limitless opportunities is also at the heart of Glice’s marketing: to adapt to this fast-paced realm and devise strategies, yielding the full internet potential, has been a key driver for the success of the Swiss company with its analog product. Powered by a mix of clever advertising and a versatile social media engine operating across many platforms, Glice generates new client-leads every day. Acquiring freelancing talent from outside the company is another core strategy for Glice: “We don’t ask what we should do and who we should hire – suddenly somebody crosses our path and we see how that person’s talents suit us and can help us grow. This is not a Business School or the army; our approach is more organic, less planned through,” explains Meier. Furthermore Glice likes to blur and erase the borders with other companies. Innovative collaborations with organizations that are more knowledgeable in a certain field trump competitiveness. The vision is to forge teams across organizations and stay flexible in ever more rapidly changing markets. There might not be one equation that shows how startups can seize the market lead in such fast-paced and shifting environments; but Glice has certainly found its personal formula to success and it is characterized by open-mindedness, humbleness, creative problem-solving and the willingness to revolt against common notions. The innovative idea of synthetic ice just wasn’t enough and needed to undergo a technological revolution first to keep up with its naturally gliding icy rival. And once a truly unique product was born, it took more than the classic organizational hierarchy to market and distribute the artificial ice. Yet, Glice not only accepted the challenge and persevered, but set its course to take advantage of the tailwind provided by the hasty market environments of our era.